Sometimes you just don't know what you're gonna get with headphones. Will they sound good? Will they fit right? 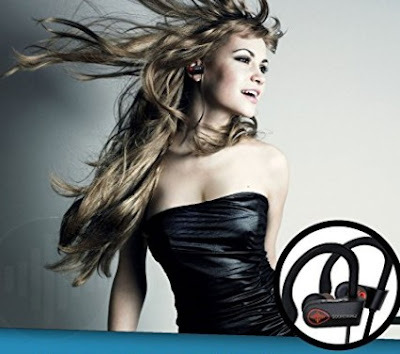 Well SoundWhiz is offering quality headphones at a good value. Awhile back, Sue Prentice and Giles Smith were both hunting for innovative ideas to bring zest to the lives of others. Ideas to inspire healthy, fun living. Realizing they shared the same vision, the two entrepreneurs merged their enthusiasm and energy as partners. And having spoken with Sue, I can tell she's a go-getter. I have the Turbo wireless headphones, giving me the flexibility and freedom to work out anywhere (wireless), in any weather (waterproof), with great sound. 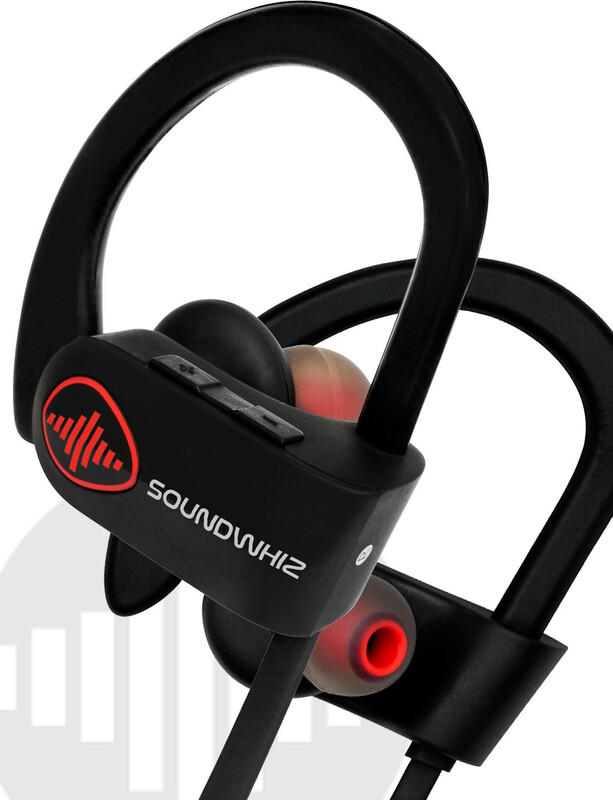 SoundWhiz insists on the ultimate finish, a softness that words can’t describe for a sports earbud. It feels good on my ears and it's pretty lightweight too. I like the over-the-ear hook design for the added security that the buds stay in my ear. It won’t be long before you won't be able to resist the urge to start moving thanks to these headphones. I'm really impressed with the sound quality, although I'm not an audiophile despite my love for music and perfection. The bass is really solid too, which is crucial to my taste. Some buds give you that "tinny" sound with little to no bass, but the Turbos are well balanced. In my opinion you're getting a great value for the price you pay. The Turbos also lets you make phone calls although I haven't tried that yet. Based on some reviews I've read from those who have made calls, an ideal setting is a quiet room. If there's a lot of background noise it might be tough for the person on the other end of the line to hear you. As for compatibility, these work with just about any Bluetooth device - Android, iPhone, smart phone, PC, Mac. Consider buying a pair as a gift for the holidays! So who wants some headphones?! 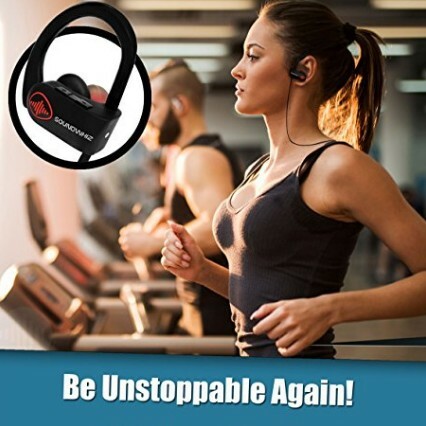 The folks at SoundWhiz have been gracious enough to offer up a pair of Turbo wireless headphones ($65 value) to one lucky Giveaway Guy reader. I've got wood floors at my house so I need good socks. Ever consider buying alpaca socks? Alpacas, not to be confused with llamas, are native to South America. And their fiber is soft and strong. Shop Perilla for great socks! Located in the UK, Perilla is home to a range of the finest quality socks made with alpaca fiber. Alpaca socks are the ultimate treat for feet. The business was born after looking for luxurious bed socks for the owner's daughter and not finding anything suitable. After a chance meeting with an alpaca breeder with an interest in producing knitwear, Sandra (owner) was steered in the direction of the alpaca socks you'll find on the Perilla website. Sandra started the business in 2006 using only British-produced alpaca but couldn't get enough high grade fiber that was needed. She now imports lots of alpaca yarn from Peru. Congrats on 10+ years of business! And we're going to be giving away some socks! My wife has the alpaca walking socks in purple, pictured above, and she loves them. Every time she wears 'em she says how comfortable they are. If you're looking for the perfect walking sock, look no further. These walking socks are warm, thick, made from 75% luxury alpaca, and perfect for winter. Did you know alpaca fiber repels odor and bacteria? This helps the socks live longer. There are more than 20 natural shades of alpaca fiber, believe it or not. It's soft like cashmere and stronger than wool. Soft and strong is not very common. It's unique in that it's extremely light, yet retains the ability to keep you (and the alpacas) very warm. 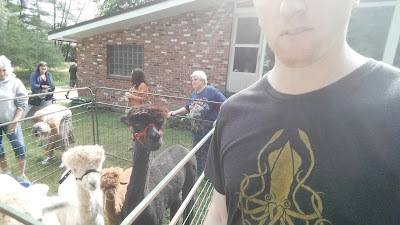 My first experience meeting alpacas in July. All of Perilla's alpaca socks, with the exception of bed socks, are made of 75% pure alpaca and 25% nylon, which gives the socks their shape. The fiber has a low prickle factor and can be worn by those who normally cannot tolerate wool on their skin. Alpaca naturally repels bacteria and odor, so you can wear your socks for a week without washing them if you want. Check out the collection for socks, hats, sweaters, and lots of other items. The sock collection in particular is pretty impressive. So who wants a pair of socks?! The folks at Perilla have been gracious enough to offer a pair of alpaca socks (your choice) to one lucky Giveaway Guy reader. Thanksgiving is over and now it's the season for giving back. Forget the "me me me" attitude of Black Friday. When you're thinking about a gift for your child or for someone else, check out Kahiniwalla first. Kahiniwalla is a business that distributes Fair Trade products and tells a story. Founders Austin & Marita Miller helps brands that don't have much of presence to become more established by helping to distribute to customers. This gives the brand more recognition in the marketplace and improve the growth potential. Kahiniwalla is helping provide employment for the poor of Bangladesh by distributing their high quality handmade products in North America. 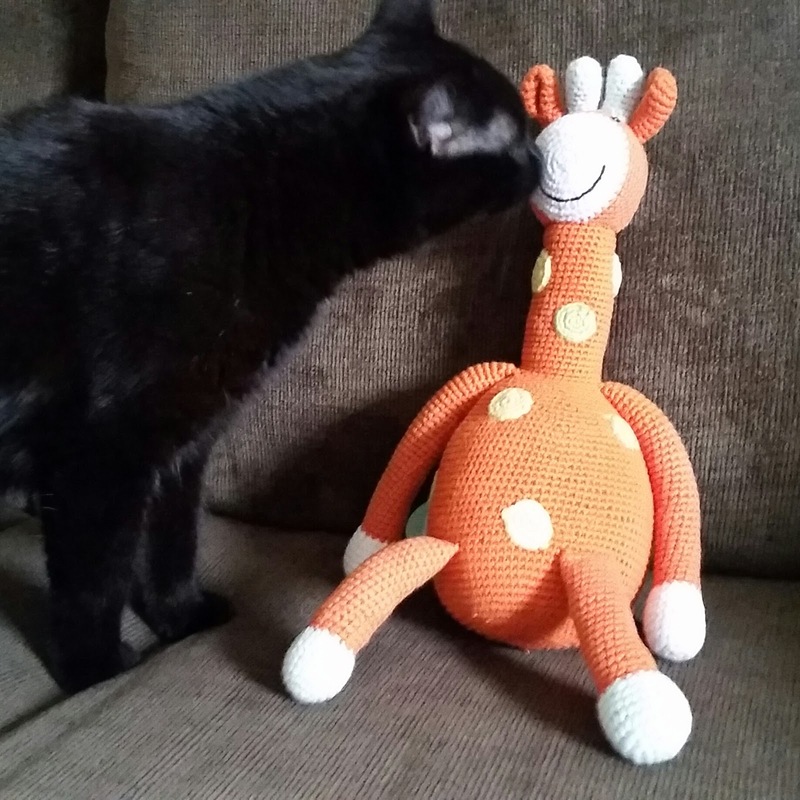 Pebble toys are big on the site right now, including the adorable giraffe pictured below. 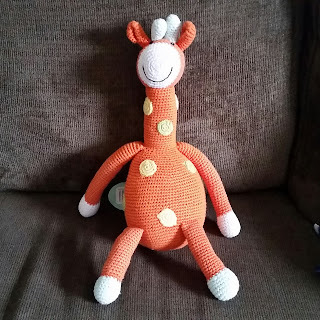 The Pebble giraffe is waiting for you to find him a home! Hand-knitted in 100% cotton yarn, he's bright, bold, and even more importantly, machine-washable. Soft, hug-able, and rather sturdy, he'll be your child’s best friend in no time. When you carry the toy around, the legs dangle and flop around. Kid's love toys like this. As I mentioned, Pebble products are made in Bangladesh by talented artisans. Pebble toys are Kahiniwalla's contribution to supporting families in rural Bangladesh, and you can help too. Doing so provides women with flexible working opportunities close to home. Look, even Jasper is curious about the giraffe's story. By supporting Kahiniwalla's distribution, we're helping women remain in the garment industry without leaving their families behind or making themselves vulnerable to violent situations. So who wants a giraffe?! The folks at Kahiniwalla have been gracious enough to offer up a large Pebble giraffe toy one lucky Giveaway Guy reader. Did you survive Black Friday? I can't believe it's time to start thinking about Christmas. 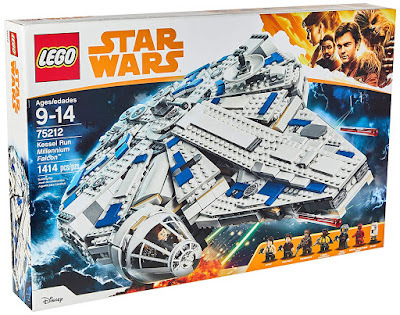 Got any kids on your list of people to buy for? Consider Little Terrace House before you hit stores. Little Terrace House makes crochet items that are handmade with families in mind. Whether for yourself or a gift for someone else, a crochet toy will become a loved part of your home. With two little boys, owner Ellie's home is filled with laughter, playtime, and the occasional nap (sort of related - I have a puppy now and when he takes a nap it's like peace on Earth). For Ellie's boys she picked up the crochet hook and started making them blankets, later moving on to toys. After taking requests to make things for other people, Ellie decided to make it official and start her own custom order business, Little Terrace House. You can order anything from her shop with your own twist, and she is friendly! Lots of fun handmade animals waiting for you to take them home! I've got the adorable giraffe. Soft, hug-able, and rather sturdy, he'll be your child’s best friend in no time. When you carry the toy around, the legs dangle and flop around. Kid's love toys like this. I love the giraffe (being tall and all), but any of the animals would be great as gifts. Ellie has a lot talent. Email her at littleterracehouse@gmail.com with your inquiries and she'll get back to you the same day. So who wants a handmade toy?! Little Terrace House has been gracious enough to offer a crochet monkey to one lucky Giveaway Guy reader. I'm a sucker for all things honey and dessert, and naturally I've discovered a local business that combines the two. Located in Salem, Massachusetts, Harbor Sweets produces handcrafted artisan chocolates from its original historic red brick building at 85 Leavitt Street, and you're welcome to go visit. I haven't been there, but I used to live in the next town over, and there's lots of cool stuff to do in Salem. You can't go wrong if you like hanging out by the ocean. 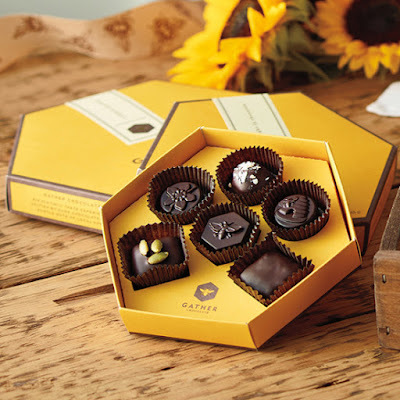 Gather Chocolate is a mission-driven chocolate inspired by the plight of the honeybees. A portion of sales (2.5%) is donated to the Pollinator Partnership, an organization that educates and advocates best beekeeping practices for the protection of bees. 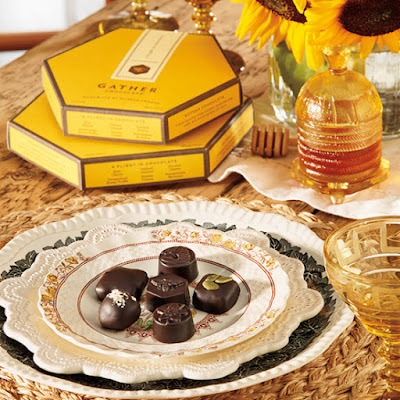 Harbor Sweets and Gather Chocolate are sold at high-end gourmet grocers and gift shops, by phone (800-243-2115), and of course on their website. They ship worldwide too. Check out this short Harbor Sweets video to help the bees, the chocolate business, and be part of the solution. Now, for the moment you've been drooling for. Who wants some chocolate?! The folks at Harbor Sweets have been gracious enough to offer up a 6-piece box of Gather Chocolate one lucky Giveaway Guy reader. Do you have a pet? You probably treat it like a member of the family, just like I do. And as pet parents we want our homes to smell and feel clean. This is where One Fur All comes in. Founders David and Robert have developed a line of freshening products for pet parents like myself. Their goal was to create products that are effective, safe, and decorative to proudly display in our homes and cars. After a year and a half of research and testing in homes with pets, One Fur All was born. All products, such as candles, are made with only the best ingredients and are hand crafted here in the U.S. to create a fresh environment for ourselves and our pets. Pictured above is the Evergreen Forest candle, part of the winter fragrance collection. Give this baby a light and you'll be walking in the woods among coniferous pines, crushed leaves, redwoods, and sweet balsam. Our house smells like a log cabin, which is exactly what we like. No kitty or puppy odors. The candle is made with a powerful odor neutralizer for effective masking of pet smells and has a long-lasting burn time of 70 hours, which is a super long time. Burning for just an hour or two a day will make the jar last forever. Made with 100% natural soy wax, it contains NO paraffin or petroleum by-products. And get this, when the candle is completely burned you can use the jar to store treats! We haven't got there yet, but will have to save the jar when we're done. 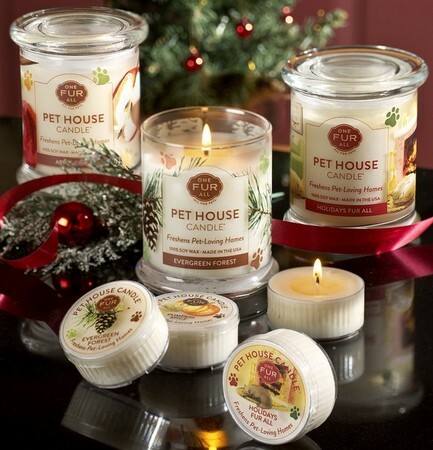 There are a few other fragrances in the winter collection (candy cane, gingerbread, holidays), and these candles would be great as holiday gifts for friends who also have pets. I'd be pretty happy if someone gifted me a One Fur All candle. Actually, even if you don't have a pet it's still a nice gift. So who wants to freshen their home?! 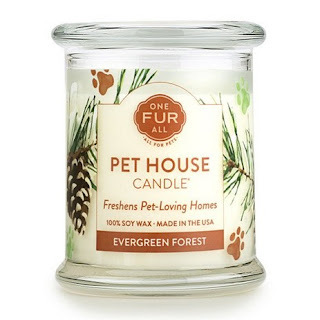 One Fur All is graciously offering an Evergreen Forest candle to one lucky Giveaway Guy reader. Golden Goddess is back with more Massachusetts honey! The past few days I've been rocking the heavy flannel shirt and drinking hot tea. And you know what I like in my tea? Raw honey for some sweetness. Do you have any in your kitchen? Golden Goddess Honey and Samantha Parsons are committed to providing artisanal honey combined with key herbs and spices for a unique, delicious product. All honey is harvested from good ol' Western Massachusetts where it's combined with the finest quality herbs and spices. I lived out there for a little while and it's a beautiful part of the state. I need to make another day trip over there before it snows. The mint-infused honey shown above (and included in the giveaway!) is great for adding to hot tea. Refreshing and invigorating, you could also consider adding it to a homemade salad dressing. You can actually add honey to a lot of things... like a smoothie, which I just made the other night. Delicious. As of right now, there are seven different honey varieties to choose from, all with various benefits and feelings - energizing & warming, spicy & awakening, and floral & calming, just to name a few. 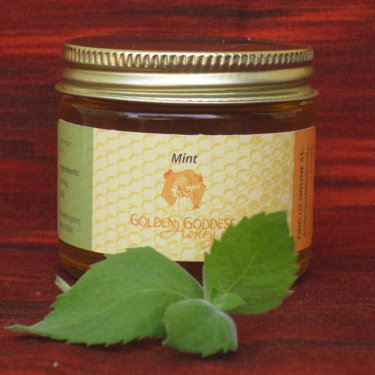 Golden Goddess Honey is also invested in helping advance the survival and well-being of the honeybee and a healthy environment. Save the bees! So who wants some honey? Samantha is graciously offering three jars of raw honey (mint, cinnamon, and vanilla) to one lucky Giveaway Guy reader. Thanks to Groupon I'm able to afford things I like at a discount - golf, clothing, etc. Here in the Boston area, it can be nearly twice as expensive for stuff than other parts of the country. And with Groupon Coupons I'm able to find coupons for stuff that I'd be spending money on anyway. Might as well save some money with a coupon. One brand that I've been loyal to for years is Hanes. It's not cool to talk to your friends about underwear, but I wouldn't hesitate to recommend Hanes. Of course I'm going to mention that Groupon has plenty of Hanes coupons. If you're in the market for new clothes, grab a coupon first. Now, what about food? We all need it. Wanna save some money then? As of this writing there are 15 Peapod coupons available on Groupon. If you live near a Stop & Shop grocery store, you can order your groceries online via Peapod (at the same prices), and have them delivered to your home. Apply a coupon and save a bit of money too. So whether you need a new pair of underwear, a shirt, or some snacks, check out Groupon Coupons. They've got pretty much anything you can think of. Happy Veterans Day, everyone. I didn't plan it this way, but I've got something that's kind of fitting for Veterans Day. We're in the thick of Fall right now, and it's fleece blanket time at my house. The MemasCreations shop has some cool fleece blankets right now, including some winter themes (is it really almost winter?). These are fun for kids, but what adult doesn't need a warm blanket? Barb, owner of the shop, has been sewing since childhood and learned her craft from her mother and grandmother. With a smile on her face, she believes her love of sewing is transferred to her work. And it shows, because she makes great stuff! Barb is both a perfectionist (which I relate to very much) and someone who is passionate about the process of creation. When she finishes a piece she enjoys a sense of accomplishment and thinking of the pleasure her work might bring to someone. Her work has definitely brought my family pleasure. A quality blanket always brings a smile to face, and anyone who has the luxury of bundling up with one. 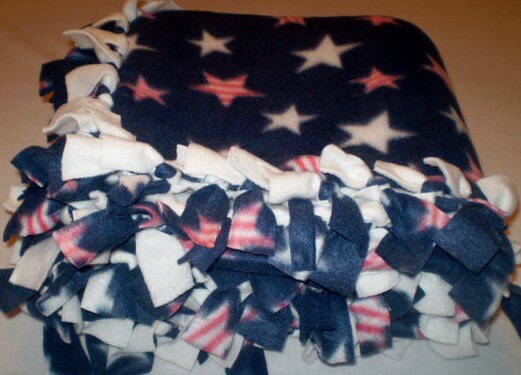 The blankets consist of two layers of fleece and are tied together on all four sides. In the two blankets shown in this post, the top layer is navy with a pattern, and the bottom layer is solid white. How big are they? The measurements are 50" x 72," which is big enough for even a tall guy like myself. 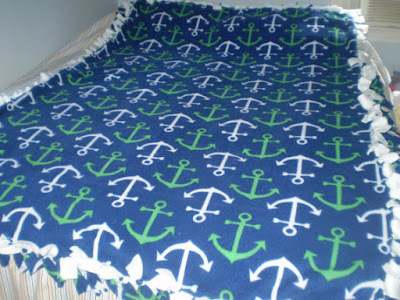 I really like my white and green anchors blanket and I've caught my cat sneaking onto it a few times. It's a coveted blanket at my house. 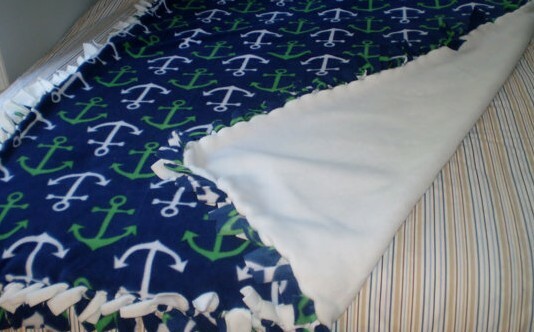 My wife actually used to make tie fleece blankets for friends, so we're very fond of this style. The blanket is soft, double-sided, and reversible if you want. I won't chill on the couch without it. Who wants to bundle up with one of these?! Barb is graciously offering a U.S. pattern fleece blanket (navy & stars) to one lucky Giveaway Guy reader. Last year I posted a Mediflow review, and now we're back with a brand new product in their line of pillows to give away! My neck has been bothering me of late thanks to sitting and staring at a computer for hours every day. My neck and head deserves support. After all, we spend a third of our life in bed so we might as well pamper ourselves. Chances are your pillow has lost its shape, right? It happens quickly for most of us, so we should replace them. 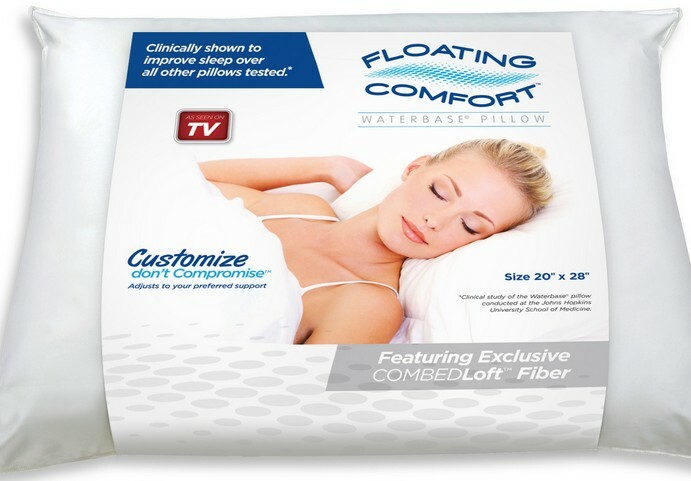 I have the pleasure of the brand new Floating Comfort waterbase pillow, clinically shown to improve the quality of your sleep. Mediflow helps you sleep unlike any other pillow on the market. Water in a pillow? That's an unusual thing. The Mediflow pillow has a soft, hypoallergenic fiber filling which is supported by a water pouch and fiberfill layer. 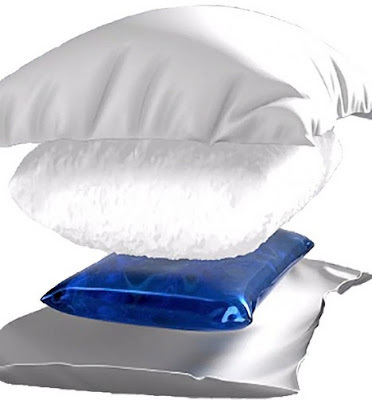 If you need a pillow for neck pain, the pillow has been clinically shown to reduce tossing and turning. Check out the Mediflow Kickstarter campaign for more details about how and why they need to showcase this new product to the public. And if you're one of the first 500 people to back the Kickstarter early bird reward, you'll get a Floating Comfort pillow for 50% off! The new Floating Comfort pillow features the exclusive Responsive Support™ waterbase® system. When combined with the new, exclusive CombedLoft™ fiberfill comfort layer, you get a pillow of unsurpassed quality and performance. Get the best night’s sleep with both support and comfort. So who wants a pillow?! The folks at Mediflow have been gracious enough to offer up the new Floating Comfort pillow ($119 value) to one lucky Giveaway Guy reader. Don't forget - if you're one of the first 500 people to back the Kickstarter early bird reward, you'll get a Floating Comfort pillow for 50% off! Miss out on the alpaca socks giveaway a couple months ago? I've been on a minor alpaca kick thanks to hanging out with the animals this past summer. Soon after starting their farm, Purely Alpaca opened a small store showcasing alpaca products to visitors of their farm. The first web store opened in 2002, and the demand for more products continued to grow. Today they've got a huge collection! It's almost overwhelming. 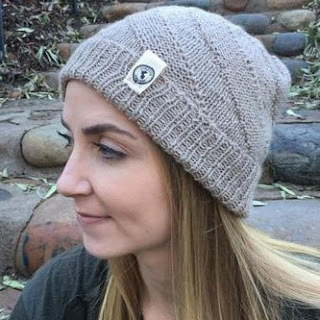 Since the beginning, Purely Alpaca has offered new features, more customer services, and a wider collection of quality alpaca products, including some awesome winter hats. Look no further for "wearable art" made with luxurious, naturally unique alpaca fiber. Purely Alpaca is the exclusive distributor for Adventure Required, a Peruvian outreach endeavor which helps the indigenous peoples of Peru to produce attractive alpaca hats themed after great explorers. The hat I've got - the Kingsley hat - is named after Charles Kingsley. It's available in a variety of sizes and you can wear it folded for a more snug fit, or of course unfolded. Did you know there are more than 20 natural shades of their fiber? It's soft like cashmere and stronger than wool. Soft and strong is not very common. It's unique in that it's extremely light, yet retains the ability to keep you warm. Only the best alpaca is used to craft these hats. 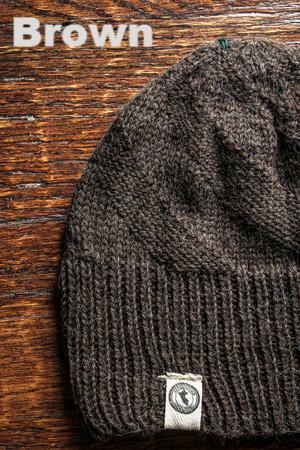 Each hat is made from 100% baby alpaca wool. From the farms that produce the alpaca fibers to the hands that knit each hat, everyone is treated with the utmost respect - the way things should be. 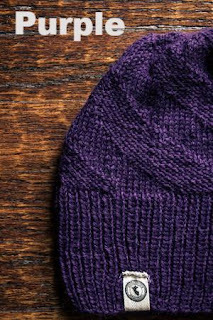 At the moment there are seven colors available for the Kingsley, and I'm thinking the purple would be a good gift for that special lady in your life. I've got the boring brown, but it's what I like. With new designers and manufacturers getting into the industry, alpaca clothing and gifts continue to expand. PurelyAlpaca will continue to show the latest interesting products created from the exquisite, naturally unique alpaca fiber. So who wants a winter hat?! PurelyAlpaca has been gracious enough to offer an alpaca hat from the Adventure Required line to one lucky Giveaway Guy reader, a $38 value. You can find bath & body products anywhere, but what about handmade? We should be wary of ingredients we put on our skin, and Etsy is a great spot to find quality handmade bath & body stuff. Norma's Bath in particular is a shop run by Norma out of Elizabethtown, KY, a state that I hear is beautiful (especially the golf courses) but have yet to visit. Products in the Norma's Bath shop are fruity, moisturizing, and creamy on the skin. Norma has carried her bath and body products in many gift shops across the U.S. since 2004 when she first started the business. My wife and I had the pleasure of trying the creamsicle body lotion (not pictured), great before bed or getting up in the morning. My wife will walk by and she'll smell just like a creamsicle, making me hungry. Use this lotion on your face, hands, wherever. If you poke around the shop you'll notice products are pretty, creamy colors. I mean, look at the lavender body lotion above. Looks real smooth and inviting, doesn't it? A wonderful trial size. I love lemon and citrus scents. I have this one in my car, as I'm always needing a lotion wherever I go. Let me say, when I received my order, I almost ate the envelope. Everything smelled soooo good! It's a treat to use these. I'd recommend and return, thanks! 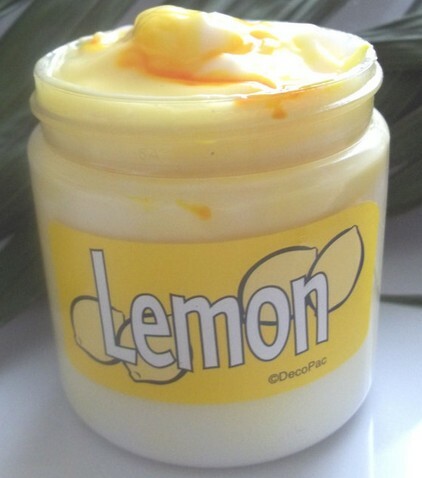 The lemon shea butter lotion is creamy and moisturizing, great for all skin types. It's recommended for use anytime, especially in the fall and winter months as we tend to get dry skin. Just apply some lotion after showering or really anytime you want. Prepare to smell like lemon! Whether you're a man, woman, or child with dry skin, give this lotion a shot and give your skin the moisture it needs. So who wants to win some lotion?! 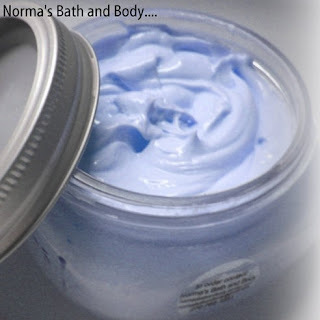 Norma's Bath and I are offering a $7 Amazon gift card and one jar of lemon body lotion to a lucky Giveaway Guy reader. This giveaway is open to users in the U.S. only. One winner will be randomly selected via Rafflecopter, which I will contact by email after entries are verified. The winner will have 24 hours to respond; otherwise a new winner will be selected. Who's ready for more candles? 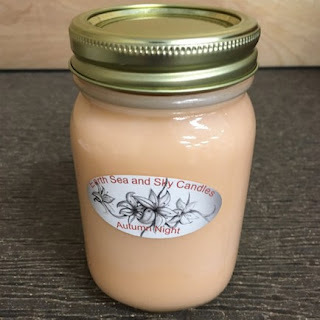 Feast your eyes and sense of smell on Earth Sea and Sky Candles, an Etsy shop run by Lynlea (or Lynn as she also goes by). 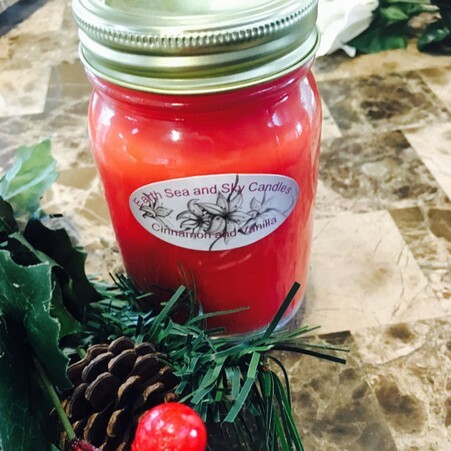 Lynn is a CPA accountant by day and a candle maker by night. As most of us do, she needs a creative release and started making candles a few years ago. Lynn loved the way her home smelled every time she made and burned candles, and the different fragrances were fun to give to friends and family. She truly enjoys the experience of making candles and has opened her Etsy shop to support the addiction! Most candles are still being made in Lynn's kitchen. It reminds me of making candles in my apartment with my then fiance (and now wife) with pots and jars of wax everywhere. If you love something you'll do it anywhere. Lynn's husband gave her a space in his workshop to pour and store her creations, and the transition into the new space has begun. She tries to keep candle batches small so that each one can have extra attention to detail. Pictured above is the Autumn Night candle. Isn't that a nice creamy color? In person it looks even more creamy and delicious. Your crisp autumn nights will come to life with the candle's notes of nutmeg and cinnamon layered with applewood and cedar. I also recommend the Cinnamon and Vanilla candle, as if you don't know what that smells like. Give this a light during the holidays and enjoy. All of Earth Sea and Sky's candles, including the two above, are made from natural soy wax and have cotton wicks. Lynn has added the max amount of scent allowable for the high-quality soy wax that she uses in the process. There are lots of other scents too, and one that I find amusing but haven't tried yet is Monkey Farts. It has notes of banana, strawberry, kiwi, grapefruit, and vanilla. Despite farts in the name, the scent is supposed to be wonderful in soaps and candles. Who wants a candle of their own?! Earth Sea and Sky Candles is graciously offering a 16oz Autumn Night candle and a 16oz Cinnamon & Vanilla candle. TWO lucky Giveaway Guy readers will each win one of them. Also, you can get 25% off all orders through November 15th with discount code 25OFF. My wife and I send lots of cards to people in the mail, believe it or not. A lot of them are thank yous, but many are seasonal too. And my wife loves critters like squirrels and chipmunks. Arrowyn is the shop owner and she has a beautiful collection of greeting cards, and some that are pretty rustic in my opinion, so this is right up our alley. Arrowyn once saw a card printed on wood that she fell in love with. She searched until she found someone who could print on wood and in an eco-friendly way. 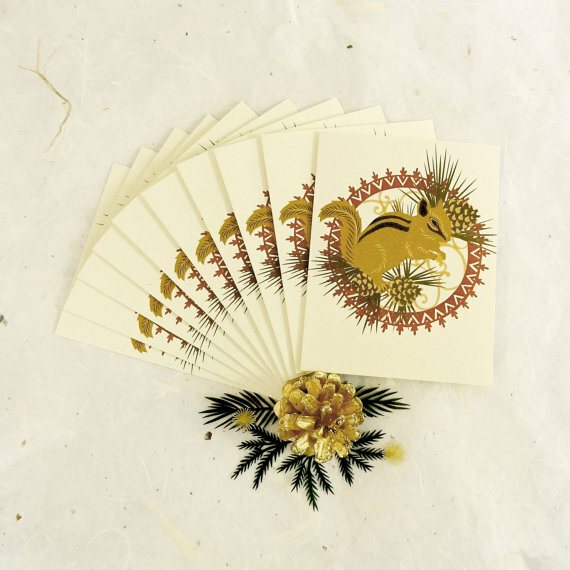 Through this marriage of old world design and new world manufacturing techniques, Little Gold Fox Designs was born. Right now, Autumn theme cards are popular in my house. 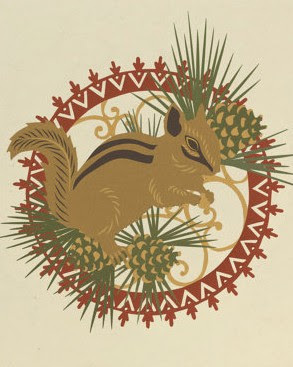 These chipmunk cards are all striking, cute, and perfect for the season. Envelopes are included of course. This design is actually a print of a paper-cutting. It's an original design in the style of the traditional German art form called Scherenschnitte, or "scissor-cuts." I'm part German and I didn't know that. The cards are printed on 100% recycled Kraft-Tone paper in the beautiful state of Oregon (never been there though). The paper is a natural white card stock with light fibers woven through. Again, they come with matching envelopes. I love the colors and the overall quality. What's more, the cards are blank inside, so no matter the occasion, you can make the message yours. Little Gold Fox is devoted to making sure products and packaging all meet green standards. So who wants to win some cards?! Little Gold Fox Designs has been gracious enough to offer up a set of five (5) chipmunk cards to one lucky Giveaway Guy reader. More than a year ago I got to sample the delicious extra virgin olive oil of Cuchi Organics, and now I've got the taste for it again. Did you know olive oil helps reduce the risk of heart disease and breast cancer? Last month was Breast Cancer Awareness Month by the way. I really like the extra virgin olive oil sold by sisters Maricarmen & Alina out of their Etsy shop, Cuchi Organics. Their passion is sharing their creations with the world and making sure we care for our planet and our bodies. That's an admirable passion if you ask me. The sisters are from Spain where they left 10 years ago. Maricarmen is now living in United States and Alina is in Germany. While they may be far a part, they still feel very close. The name Cuchi Organics honors the memory of their mother - Cuchi was her nickname. And I love this olive oil. Let's face it, unless we're at a restaurant and we're being served bread and olive oil as an appetizer, many of us probably don't consider it for our diet. But we need to make sure we're consuming the right kind. I'm not talking about store bought. Here’s the hard truth: the olive oil in your pantry, the one you bought for its health benefits and for some sliver of the seductive Mediterranean lifestyle, is most likely a scam. A scam, meaning it probably contains less actual olive oil than you’d ever imagine. A scam, meaning it’s likely been mixed with colorants and other less expensive oils like sunflower-seed oil. A scam, meaning you really have not been getting what you paid for. About that taste? Prepare yourself. Real olive oil – the good stuff – will be powerful and peppery and it will catch in your throat. You may cough, your eyes may water. But these are in fact good indications that what you’re tasting – finally! – is authentic. 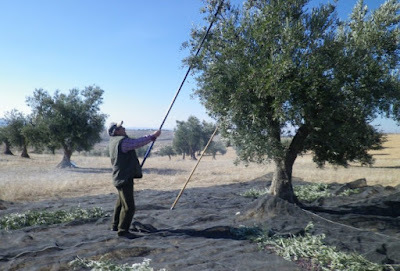 It is also full of the reasons, especially flavor and health, that we were drawn to olive oil in the first place. Check out what else you need to know here. You should get organic olive oil that's extra virgin and produced with wholesome methods, and Cuchi Organics is here to help! If you're like me, you'll love the oil with bread as a snack or before dinner, but it's also great for pasta and rice. Just a tablespoon for one serving. To keep it fresh, keep the jar in a dark place at room temperature or keep it in the fridge up to two years. So let's give away some olive oil! 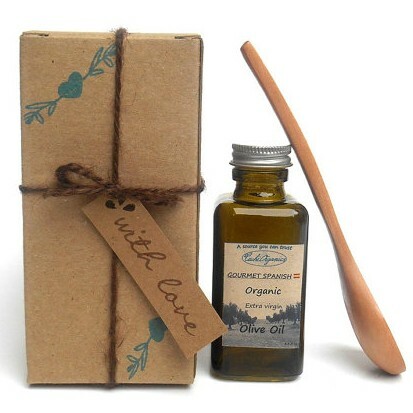 Cuchi Organics is graciously offering a jar of organic Spanish extra virgin olive oil and a wooden spoon to one lucky Giveaway Guy reader. You can also get 10% off your purchase in the shop with code SOCIAL10 in appreciation of those who follow on Etsy or Instagram.